This is the Duracast Round Open Top Aquaculture Tank - 90 Gallon. Dura Cast Products manufactures several types of tanks for the Aquaculture industry including: open tops, vertical and cone bottom tanks. All of our tanks are FDA and UV stabilized. Open Top Aquaculture Tanks are typically used for water, liquid, or solids storage, planting pots, bathing, fish & reptile breeding, and containment vessels for other tanks. Because they have superior mechanical properties, high stiffness, excellent low temperature impact strength, and outstanding environmental stress crack resistance, they stand up well in these tough environments. 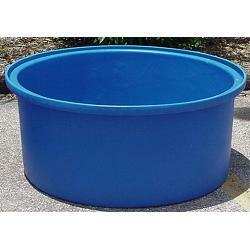 Blue Open Top Aquaculture Tanks that have a smooth inside surface are used extensively for breeding and raising fish. 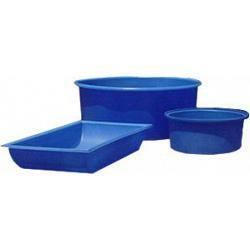 The FDA compliant polyethylene is safe and non-toxic to aquatic and animal life. A Tank-Your-Way blue colored tank eliminates shadows that scare fish; and thus, minimizes stress in the fish causing them to be more productive, healthy and active. Dura-Cast Products, Inc. warrants each product it manufacturers to be free from defects in material and workmanship under normal use and service for the period described below (depending on the product). years from date of purchase. This warranty extends only to the original purchaser (Buyer) and shall not apply to defects or malfunctions resulting from, but not limited to, failure to properly install, secure, use, or failures from abuse, accident, or negligence. Dura-Cast will only repair or furnish a replacement tank, at our discretion, in the event of a failure that is found by Dura-Cast to have been a result of a manufacturing defect. Dura-Cast assumes no responsibility, liability, or obligation for any costs associated with removal or re-installation of a defective tank into its installed position. Dura-Cast shall not be held responsible for any loss or damage to personal property in, or next to, the failed unit, or any other consequential damage to the extent such damages are excluded under state law. No responsibility is assumed for loss of use of the unit or the inconvenience caused thereof. ANY IMPLIED WARRANTIES OF MERCHANTABILITY SHALL BE LIMITED TO A PERIOD OF THREE YEARS FROM DATE OF PURCHASE. THE FOREGOING WARRANTY IS EXCLUSIVE AND IN LIEU OF ALL OTHER WARRANTIES, EXPRESSED OR IMPLIED, INCLUDING BUT NOT LIMITED TO ANY WARRANTY OF MERCHANTABILITY OR FITNESS FOR ANY PARTICULAR PURPOSE. DURA-CAST SHALL NOT BE LIABLE FOR ANY SPECIAL, INCIDENTAL OR CONSEQUENTIAL DAMAGES, WHETHER IN CONTRACT, TORT OR OTHERWISE. A notice of tank failure must be made to Dura-Cast before any warranty coverage will be authorized. Please call 1-800-683-4116 to explain the problem with the industrial tank and receive instructions on how to proceed. Tank returns will not be accepted without a valid Return Goods Authorization (RGA) and warranty replacement tanks are all F.O.B. Lake Wales, FL 33859. If replacement is required, obtain an authorized Return Goods Authorization (RGA) from Dura-Cast, prepay transportation costs to Dura-Cast, and ship the tank with its authorized RGA clearly visible. Include a description of the failure. Transportation in both directions is the responsibility of the Buyer.